To all my PMP "Bellybutton Club" friends, yes, soon everyone will want scars like ours. Sa-Weet! Only in the World of Dr. Seuss would creatures be happy to flaunt huge vertical scars on thier midriffs. 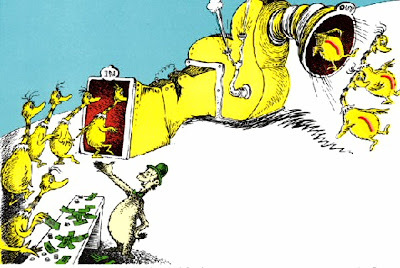 I would expect nothing less from you than to find a Suess image like this! I'll be in Houston on the 19th. If you are still in the hospital I can drop by and keep you company if you would like. It's always nice to be able to meet another one of the "club" and put a face to a name. Your going to come through this with "Suessian" flying colors, I just know it! Stay strong and know that we are all with you. I have found ....chicks dig scars!...wives not so much! Dr. Seuss for a surgeon and The Bumble for a tree topper. Makes me wonder what you do for Thanksgiving. Houston may not be warm, but it's been snowing here all day and Sheboygan is getting the same. Best thoughts and enjoy the meds. !